Key Play features 5 of my originals and 6 standards. Kenny was playing at Cape Cod for a festival and drove up to the studio in Methuen, Ma which is about a ½ hour north of Boston. We said hello, exchanged pleasantries and started recording. The whole session took less than 3 hours and all of the tracks are 1st takes. Usually the first takes have the most sparkle and freshness. It was nice to see Kenny’s “effortless mastery” in action. The duo format really allows for very intimate conversation. It is one of my favorite formats for playing. With just two people, it’s so easy to “stop on a dime” and switch gears. There’s more of a chance for spontaneity, the dynamics can have a wider range and there’s more freedom with varying textures. The vibes have a nice blend with the piano and having a pianistic approach to the vibes it was easy to play with Kenny (especially considering Kenny was right there behind me at every turn). I’m pleased with how the recording came out and how Kenny played on my compositions after looking at them for about 5 minutes. It should be noted that he didn’t play it safe on them either; he stretched out and took some chances. After all, that is a facet of his philosophy in his book, “Effortless Mastery”. 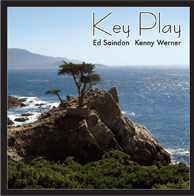 Key Play is currently available for purchase from Amazon and CD Baby.